This month Butterfly Dolphin will be bring awareness to “Lupus”. Lupus Awareness is for the month of May and is designated by the purple ribbon. So, what is Lupus? Systemic lupus erythematosus (SLE or lupus) can affect any organ in the body and may cause a wide range of symptoms. What’s more, SLE symptoms can vary from person to person—and change over time, even within the same person. That’s why it’s so important for people with lupus to monitor their symptoms, even when they may seem minor, temporary, or unrelated to their other symptoms. Over time, SLE can even lead to organ damage. It’s important that you understand your symptoms and share them with your healthcare team, because they could be signs that organ damage is occurring. Lupus affects many people around us. Some you may never know simply because they try not to allow it to change the things they do in a day to day basis. 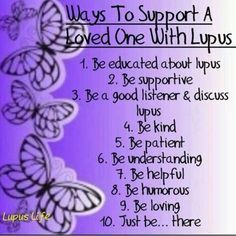 If you know someone with Lupus, be patient and be there for them.